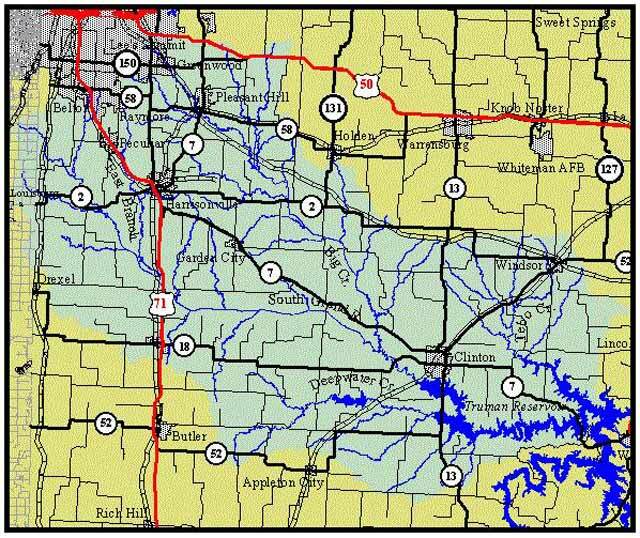 The South Grand River Watershed drains a 2,046 square mile area located in eight Missouri counties and a small portion of two Kansas counties. The Truman Reservoir at Clinton, Missouri is the end of the journey for the waters in the South Grand River Watershed. The landscape of the South Grand River watershed in pre-European settlement times was vastly different than the one we see today. Tall grass prairie and oak savannah dominated the area with open oak woodlands defining the stream corridors. Today, cropland, fescue pastures and urban areas have replaced that landscape. The loss of the prairie landscape and the one that has replaced it as a result of human activities has significantly impacted the quality of the water in our waterways. Agriculture, coal mining, stream channelization, and urbanization are among the human activities that threaten the health of our water resource. The sediments, fertilizers, and pesticides resulting from agricultural practices wash into our streams and degrade our waters and the aquatic system. Leachate from coal mines adds toxic chemicals to streams while storm water runoff from impervious rooftops, street and parking lot surfaces and lawns of the urban areas washes many pollutants and sediments into the drainages of our watershed to degrade and imperil water quality. This runoff also contributes to erosion, habitat degradation and property damage from flooding. The long-rooted prairie plants and forested riparian corridors of the past have virtually disappeared from our landscape. They are no longer present to serve the function of slowing, filtering and infiltrating the storm waters that used to protect the quality and quantity of our water resource. With knowledge about the characteristics of a healthy watershed and actions that can be taken by each of us and our governing bodies, we can work together as a community to restore, protect and preserve our essential water resources. We invite you to join us in these efforts.